This is near Tombstone where the river is still frozen. This picture only shows a small bit of how cold and blue the ice on the river was. 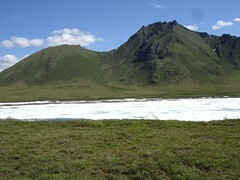 The Tombstone Mountain Territory Park are unglaciated and therefore are very smooth and round and looks a bit like Ireland. I guess Nancy face says it all. "Yuck! I can't ride is this stuff. Actually I can't even walk in this mud" We could only walk a few yards before we had to polk out the mud from around the wheels and gears. Amazingly everything still worked after we got out of this slop. But is all part of the adventure. We had to have one war story. 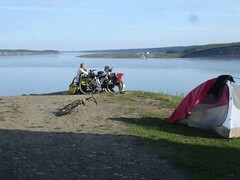 Here is we are camping in back of the church at Tsiigehtchic which over looks the great Mckenzie River. Little Anthony, one of the kids in the village joins us for several meals. The Gw'chin, the local aboriginal people, have lived here for as long as anyone can remember, came here to hunt and fish and then moved on with the season. 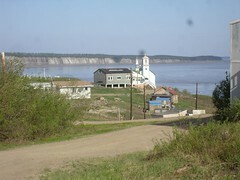 Now it is a village of perhaps 200 people who live here year round. Anthony dad, Russel, helps run the ferry which you can see in the far distance. This one just one of the three ferry crossing we have used so far. A bridge can not be built here because of the freezing and thawing of the river is too mighty it has knocked down bridges that have been built before. Several places we found these signs. 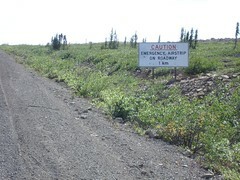 The road is widened and made into an air strip landing. This sign has a new meaning of share the road. 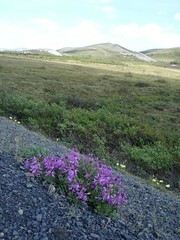 This is what the tundra looks close to the Artic Circle. 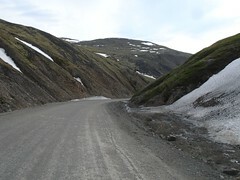 Look there is downhill on Wright pass. Yey. This is a shot of the village church which we camped in back of because it was cooler and had less mesquitos. What a view. We would like to introduce Carol Norwegian and her mom, Teri. 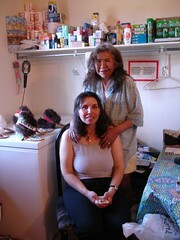 We meet Carol walking 125km from Tsiigehtchic to Inuvik in order to raise money for cancer. Terry, a survivor, creates incredible tradition needle work and beading on footwear made from local hides which is shown in this foot. 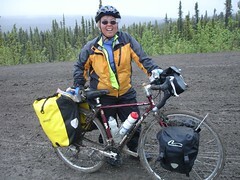 Carol gave us all her unused granola bars and bug spray which we needed to get over the many hills on the dempster. Thanks Carol and Terry. You are wonderful folks we treasure meeting. We made it to Whitehorse, the capital of the Yukon. We had a great trip - some new friends, some rain, some sun. A bit slower than we had expected. When we rode into Whitehorse we saw the first traffic light of the trip. We've been almost 800 miles without seeing a traffic light! Where can you do that? Today our friend Rob Ungless is flying in from Vancouver and we're going to ride down to the sea and visit southeast Alaska. I don't expect to be able to post anything more for a few days, but hopefully we can get you some pictures of the wonderful Klondike and Yukon area.